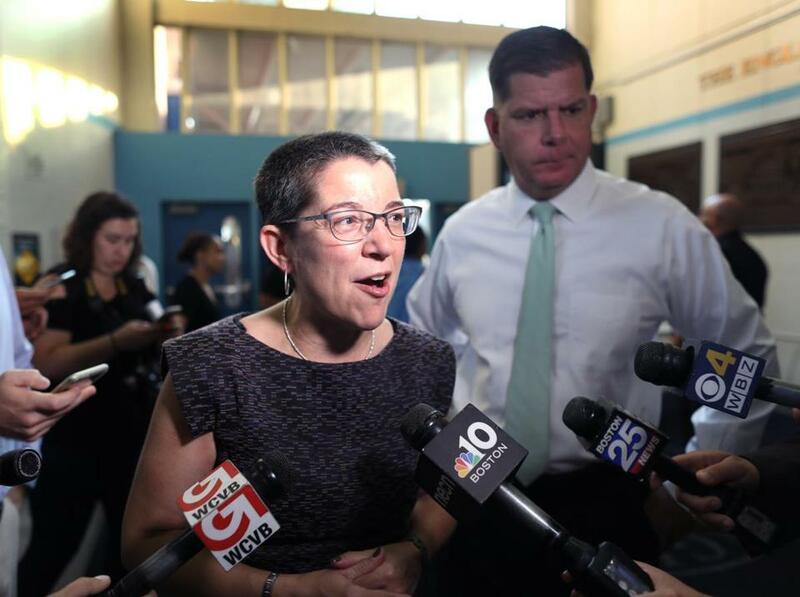 Mayor Martin J. Walsh (with interim superintendent Laura Perille at English High on the first day of school in September) opposes a return to an elected School Committee. It is arguably the most important job of any school committee anywhere: the power to hire and fire the superintendent. Yet in Boston last summer, it was not the School Committee that decided the fate of then-Superintendent Tommy Chang. It was Mayor Martin J. Walsh. He was the one who had a tough conversation with Chang about his future, prompting Chang to resign and catching the School Committee off guard. The episode is fueling a debate about whether the mayor, who appoints the seven-member School Committee, exerts too much power over the 56,000-student system and whether it’s time for Boston to give control of the School Committee back to the voters. The City Council on Tuesday will hold a hearing on the issue, a meeting that will probably include emotional testimony and revisit the school system’s history of political corruption and racial division. Among the questions to be explored: Has Boston advanced enough in the past quarter century to avoid repeating its past mistakes with an elected School Committee? And if the city maintains an appointed board, are there ways to improve it? Potential divisions are already emerging. Parent activists and civil rights leaders tend to favor an elected board or at least want to explore the idea, while those with ties to the business and nonprofit worlds tend to be unwavering supporters of an appointed school committee. “I think a lot of families feel like they are not being heard, and at this time it doesn’t appear the School Committee is accountable to students and families in the Boston Public Schools,” said Jane Miller, cofounder of Start Smart BPS, a parent organization that emerged last year after an ill-fated proposal to change school start times riled families across the city. On the other hand, she said, there is some appeal to having the mayor in charge of school performance — given that he controls the city’s finances — and holding him accountable for the results. Others prefer that the elected School Committee remain deep in the city’s past. The debate comes at a critical juncture for the system as it embarks on the search for the next superintendent. Walsh also recently saw the departure of his top education adviser at City Hall, Rahn Dorsey. Walsh opposes returning to an elected board. Returning to an elected School Committee would likely make it more difficult for the mayor to effect change in the system, especially at a time when officials are attempting to tighten spending. The school system’s $1.2 billion budget represents a third of city spending. Such a change would require a long, cumbersome process, likely including a non-binding voter referendum and approval from the City Council, the mayor, the Legislature, and the governor. For that reason, City Councilor Annissa Essaibi George, who chairs the Education Committee and called for the hearing, wants to explore all options, from tinkering with the current appointed board to abolishing it. At minimum, Essaibi George said, she wants to remove the mystery surrounding committee appointments by making the process more public. The mayor currently appoints members based on recommendations from a 13-member nominating panel. That panel interviews applicants in public, but deliberates on its recommendations behind closed doors, settling on about five recommendations for each open seat. The city’s seven School Committee members serve staggered four-year terms and receive an annual $7,500 stipend. Boston turned to an appointed committee in 1992, handing then-Mayor Raymond Flynn a hard fought victory. In making the change, Flynn hit on a simple theme: the power of unity. The elected School Committee had been notoriously dysfunctional, with decisions often falling along racial and neighborhood lines. Meetings ran well into the night, while political patronage, corruption, and budget deficits ran deep. Many education experts have pointed to the current governing structure as a model of stability for the often divisive world of urban education, where political jockeying and neighborhood politics can derail sound policy-making. The appointed board hit its stride under Thomas M. Menino, who served as mayor from 1993 to 2014, resulting in the 11-year tenure of Thomas Payzant as superintendent and the six-year tenure of Carol Johnson. The period saw incremental improvement in student achievement, historic gains in high school graduation rates, and national acclaim as one of the best urban systems in the country. But dissatisfaction over the loss of a democratically elected board has lurked persistently in the School Committee chamber, and in the past year, the calls have grown louder. The committee lost some public credibility last December when it approved a sweeping measure to change start times without analyzing the impact on individual schools or even knowing that many would wind up with 7:15 a.m. starts. The plan created a firestorm, and a few weeks later officials pulled it back. Parents nevertheless began talking about wanting more control over the School Committee. The controversy over Chang’s resignation and his replacement only heightened interest in exploring an elected board, as did the rollout of a long-term school construction plan, which has raised concerns about school closures and lack of community engagement. “Many people feel there are no checks and balances, a lack of accountability, and feel their voices are falling on deaf ears,” said the Rev. Willie Bodrick of the Boston Network of Black Student Achievement. Michael Loconto, Boston School Committee chairman, defended the board. Samuel Tyler, president of the Boston Municipal Research Bureau, shakes his head about any return to an elected board. His watchdog group, funded by businesses and nonprofits, pushed aggressively for the appointed board. “The appointed board gives the best chance for diversity and the breadth of experience you want,” he said. Black and Latino members currently hold five of the seven seats on the appointed board, and most of them work in academia. By contrast, just four of the 13 seats in the final year of the elected board in 1991 were held by people of color. But some believe an elected School Committee in 2018 could have more diversity, pointing to the changing composition of the Boston City Council. An elected board could also result in greater parent representation. Currently, just two members have children in the system. Yet concerns exist that School Committee elections in Boston could get hijacked by special interest groups, from deep-pocket charter-school supporters to teacher unions, a phenomenon that has affected races in other parts of the country, particularly in California, leading to radical shifts in education philosophy of board members and instability. Julia Mejia, founder of the Collaborative Parent Leadership Action Network, said she would like Boston to move slowly back to an elected body so it can come up with safeguards to prevent special interests from controlling the races. She said she sees an elected board playing a pivotal role in giving communities of color more say in policy decisions. Correction: An earlier version of this story misstated the process for interviewing school committee members.